When I was 16 I went to Israel with a group of friends. We were very lucky to be left to our own devices most evenings. While we were in Jerusalem we would go from the hostel at Mount Scopus every night, into the Old City. I loved the freedom but all the time we were aware of the threat of suicide bombs and attacks and the army that was visible everywhere. 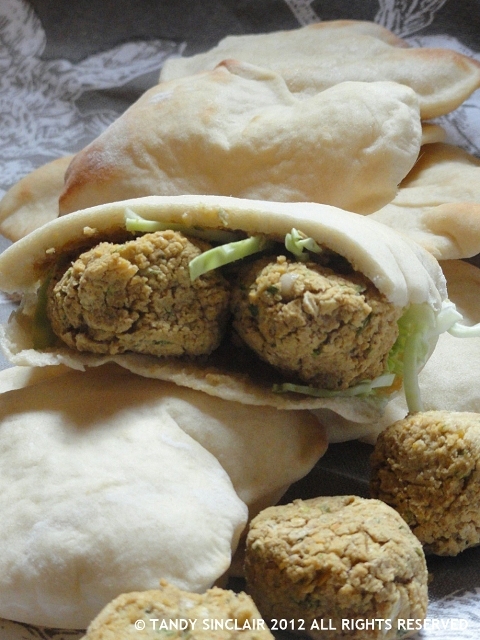 I was a vegetarian when we were in Israel and my nightly treat was felafel, served in pita bread with hummus. I have wanted to make felafel for a long time now, but I am put off my the fact that they need to be deep fried. I do not like deep frying anything and the only time I will do so is to make my battered fish. My friend Hila at Add To Taste is Israeli by birth, and she has told me that the proper way to make felafels is to use raw chickpeas. I decided not to listen to her and used tinned chickpeas instead, as I thought that would be best for baking them. I used tahini as a binder for those of you who are vegan but I think they will hold together better with an egg yolk. They are crumbly and could fall apart, but as the felafels get stuffed into a pita that is not a big concern. I would love someone with an airfryer to make these and tell me how they work out, as I am really considering getting one for my new kitchen. do you deep fry anything? Sounds great, I will try this using a little egg and some rye breadcrumb to hold it together a bit. I VERY rarely deep fry anything, I find it just revolting! Tahini in the felafel mixture, sounds very good, I love felafel and welcome variations. I rarely deep fry things. Although I don’t mind eating them, something about the splattering oil isn’t very pleasant! Tandy, Pitta bread and hummus has always been one of my favourite snacks! But I’ve never tried felafel. Project! Pita and hummus are favourite snacks of mine as well! Hi Tandy, this looks wonderful, will have to give it a try soon. I also avoid frying on a regular basis. These look fantastic! I too love felafel, but don’t want to make them due to the deep frying. This is perfect! They can be crumbly but they taste so good! I tried the veggie thing for a couple of months when I was younger but the second I smelt bacon frying it was all over! I am so weak! When I looked at the airfryer I was concerned about the small cooking compartment – so would love to hear what your readers have to say who own one. i love felafel! What a great recipe! Very good snack food. I remember some good falafel places in St John’s Wood in London. I try to avoid deep frying too and I too want to get an airfryer! If you find out something or how it cooks please let me know!The felafels look absolutely mouthwatering! I never fry anything either. I would love to give your baked version of felafels a try as they look great!